My extremely affectionate baby sister Sarah decided in the past that she liked stroking my hair. Now, I don't like people touching my hair at all. That's part of the reason I don't get it cut often. I cringe when people touch my hair, and there's a reason for that. But Sarah is my precious baby sister, she's young, she doesn't know, and I determine that I'm not going to push her away by telling her. My mom yells from across the room, "Quit that, Sarah! Rachel hates it when people touch her hair." I was surprised for a minute that my mom knew, that she remembered. And then I reminded myself, she's my mom, she gets me, of course she remembers my quirks, for good and for bad. In my freshman year of college, I attended a banquet. I was sitting next to my friend Angel when the speaker said, as an introduction to her speech, "I'm not the smartest girl at Calvin. I'm not even the smartest girl in this room." I was just thinking to myself that I would never start a speech with those words when Angel leaned over to me and whispered in my ear: "If you were up there, you'd probably say 'I AM the smartest girl at Calvin and in this room.'" I told that story to my mom, and from that point on, she knew Angel was the one to watch. Why? Because he understood just the kind of person I am, and Mom knows how powerful that sort of understanding can be. Some time ago, my sister wrote to me: "How does Angel know that you say "X" and draw an X with your finger in the air when you don't like something?" She was surprised. She knows that little idiosyncrasy, but she was surprised Angel knew it too. The fact is, Angel lives with me. He gets me. He pays attention and understands me--and I cherish that understanding because I know it's a treasure of great worth. He knows that some things are much harder for me than they might be for others, and that other things are much easier for me than they are for others--his expectations and understanding of me are not based on the arbitrary roles I might fill: "This is what a wife is like." "This is what a 25 year old is like." "This is what a woman/American/Caucasian/cosmetologist/etc. is like." Instead--he knows me as simply myself, with my own unique ways of thinking about and responding to the world. Do you know how seriously awesome that is? I understand him, too. When he posts certain sorts of statements on Facebook--I can just roll my eyes over at him and say, "Everyone's going to think you really mean what you said." He'll grin that crazy grin and say, "I know! Isn't it hilarious?" I know when he's being truly himself and when he's switched into some alternate version of himself that he thinks is appropriate to the current situation. I know when something's actually bothering him or when it's just his fierce eyebrows contributing to his overly serious expression. Not everyone will understand you all the time, and that's perfectly okay. When I write satirical blog posts that are taken seriously--it's obvious that not everyone understands my writing style. We all experience misunderstanding constantly. People who don't quite get us make assumptions about our inner motivations that are entirely untrue, that lead to awkward conversations, strained relationships, and feeling like we have to walk on tiptoe around someone else or pretend to be people that we are not. Many in our lives will never really understand us, our inner motivations and the way our brains work and process information. Instead, because it's simpler, they put us in categories (by race, gender, age, job, education, role in society), and assume that we have the same motivations as others in our general category. It would be unreasonable to expect everyone who interacts with us to 'get' us--so instead we learn to get along in a more surface-level relationship, navigating differing expectations of motivations and actions in order to preserve balance. To be truly understood, deeply known and simply accepted for being the person that we naturally are is a longing we each have. Hopefully, we each have at least a few people who fulfill that longing, and we ought to meet that need in a few other peoples' lives as well. People who understand us in both the really important ways--motivations, deepest loves, goals--and in the little ways--habits, idiosyncrasies, likes and dislikes--are just the best ever. When you find those rare people who do 'get' you--don't let them go. Write down their phone number. Stay near to them. Get your advice from them. Marry them, if need be. They are too precious, so hold 'em close. Who are the people in your life who 'get' you? 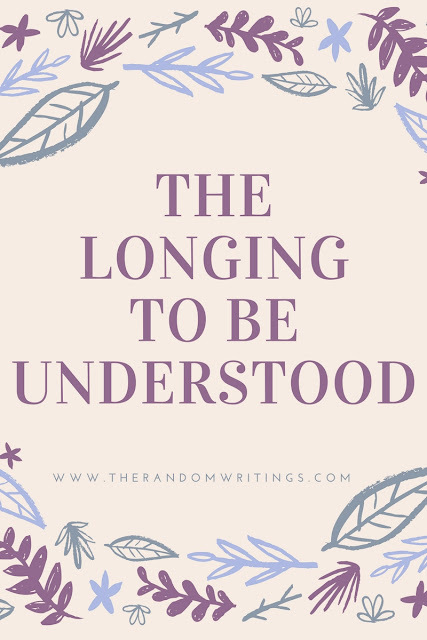 Have you ever had experiences or relationships where you felt as if the other person did not even begin to understand you, and you didn't understand them, either? It's really nice when you understand your spouse and they understand you. I had that problem when I used to be on Facebook. People didn't know I was joking or saying something in fun. Well, in my case only my closest friends "get me" because I'm very sarcastic and I enjoy the company of people who get it and also are having a laugh with me because of it. Finding a person that 'get's you' is a wonderful thing. I'm lucky to have found that in my husband. Although he doesn't truly understand why I have anxiety, he knows how situations and experiences could effect me and he makes an effort to be considerate of that. There is nothing like being with someone who gets you! There were many reasons why my last relationship ended but one of them was that we just didn't get each other and after a year and a half it was frustrating. It lead to a lot of unhappiness on my end because I always felt I was being way more flexible than him and like I couldn't really be myself in some situations. Luckily I have two best friends that understand and appreciate all my quirks! Last week, my husband and I were talking about meal planning before an ice storm hit over the weekend. B: I assume we're going to have soup at some point this weekend. B: Because it's going to be cold and you'll probably want soup. Later as I was making the shopping list, nothing really sounded appetizing. Me: Hey, what kind of soup did you think I would want this weekend? B: Probably something with chicken. You usually like chicken. I love this post. I feel like most people do have at least some sort of longing to be understood. I definitely have lots of days where I feel like no one really gets the situation I'm in and what my life is like, but I have enough people who get part of it, or at least are super understanding/make the effort to try to understand, that it makes it okay. (I've been super blessed with great friends. :] ) That's awesome that you have someone like that in Angel! Being able to find someone like that is rare! The main thing that convinced me that marrying my husband was the right thing to do was that he and I got each other right from the get-go. Which is quite rare for me. The other thing I find interesting is that you can never predict who is going to get you - it can be the people you least expect. It's such a great feeling when you find a new person who gets you! I was nodding along to everything you've written here, and smiled at your stories about Angel. He definitely gets you and there truly is no better feeling. I feel like Nick totally gets me, and one of my favorite things is when he makes an insightful comment to me about myself. That's how I know he gets me - like the comment Angel made about the speech. I feel like I can totally be myself with Nick, and I've told him so many times that being with him is just so easy. I think that I get Nick in the same way he gets me. When we moved to Hawaii I started going out and meeting all kinds of different people. There were a few that I clicked with immediately, and a few that I liked but just didn't have that same connection with. They are such nice people and I definitely will still see them, but that level of understand just wasn't there. It made me realize how much I had been taking for granted my friends and family who really do get me. I am so much more grateful for them now, and I am grateful for the friends I've made here who I feel like get me. Thanks for this post, I really enjoyed it. James understands me better than anyone, but even he fails to detect my sarcasm occasionally which always makes for a funny conversation. I've often felt the same way, that it is so rare for a person to truly understand me, and I cherish the few people who do. Writing blog posts reminds me more than anything how different our minds work by the way people assign false motives to other people's writing. It can be maddening at times. Yep, my husband has always been the one to understand me so well! Love this! I was just nodding yes the entire time reading! This post made me cry a lot. I can't imagine how I got though life here before Joey. I need that, not from everyone, but at least from one. I feel you, 100%! My problem is the fact that I tend to want to be a people pleaser while also having pretty rigid ideologies and so my brain and my heart are at constant war. Thankfully, my husband gets me and he is great at encouraging me away from the anxiety those two things together can cause!